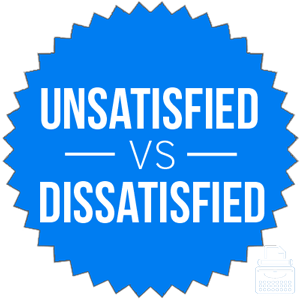 Home » Unsatisfied or Dissatisfied – What’s the Difference? There are a lot of words in English that mean not happy. Unhappy is an obvious one, but we also have angry, annoyed, unsatisfied, and dissatisfied, as well as many others. Aren’t unsatisfied and dissatisfied basically the same word, though? They share the same root, but they have different prefixes. And, in this case, the prefixes make all the difference in the world. The real question, though, is when you should use each of these words. As it turns out, there are clear usage cases for both options. What is the Difference Between Unsatisfied and Dissatisfied? In this post, I will compare unsatisfied vs. dissatisfied. I will use each version in at least one example sentence, so you can see the words in context. Plus, I will show you a helpful memory tool that you can use when you aren’t sure whether to choose unsatisfied or dissatisfied. What does dissatisfied mean? Dissatisfied is an adjective. Someone who is dissatisfied is upset or annoyed at something. A person might be dissatisfied by a lack of results, or by poor performance on a test. The coach offered words of encouragement to his team after the loss, but it was clear that he was dissatisfied. When mom gets dissatisfied, she often takes her frustrations out on her youngest child. Someone who is dissatisfied is positively bothered by his or her lack of satisfaction. What does unsatisfied mean? Unsatisfied has a similar meaning to that of dissatisfied, but the words are not quite interchangeable. To be unsatisfied is simply to be less than fully satisfied. The same event might leave one person actively annoyed (dissatisfied), but another person merely less than 100% happy (unsatisfied). Unsatisfied is a negation of the adjective satisfied, which means fulfilled or content. The prefix un- basically means not in this context, so unsatisfied means not fulfilled. I enjoyed the pizza, but I am unsatisfied because I wanted another piece. Lauren got an email reminding her that she has unsatisfied requirements on her financial aid checklist for the coming semester. It isn’t 100 percent exhaustive, since it only looks at books published in English since 1800. Still, it lets us see a clear, long-term usage trend. Dissatisfied is more common than unsatisfied, but both see widespread use. The difference between unsatisfied and dissatisfied is one of degree. To be dissatisfied is to be angry or annoyed. If you are dissatisfied, you are positively annoyed. To be unsatisfied simple means not 100 percent satisfied. If you are unsatisfied, you aren’t annoyed, but you weren’t completely satisfied. Bryan Garner gives a helpful example illustrating the difference between these two words. If you are owe a lot of money on your credit card, you debts are unsatisfied, but your creditors are dissatisfied. Since unsatisfied and unfulfilled are synonyms and share the prefix un-, you should be able to use this word as a reminder of the meaning of unsatisfied. If you do find yourself in a situation where either word would be accurate, it might be smart to default to dissatisfied, since writers have used it more often over the past two centuries, and readers will likely be more familiar with it. Is it dissatisfied or unsatisfied? Dissatisfied and unsatisfied and are almost synonyms but not quite. To be dissatisfied is to be angry or annoyed. To be unsatisfied is to be unhappy or not fully content. The words have similar meanings, but careful writers know how to distinguish between them and use each for maximum effect. What is the prefix for the word satisfied? In this case, satisfied either takes the prefix –un or ­–dis, each having its own meaning. In this case, the prefix –dis is used to express annoyance or angry from not being satisfied while ­–un expresses the simple absence of a satisfaction. What is your definition of a dissatisfied customer? That depends on your business. If you now know the difference between these words, I would consider you a happy customer! What is the meaning of unsatisfaction? Actually, unsatisfaction is not a word. Is it unsatisfied or dissatisfied? This depends on the context and meaning you intend. See above. 1 What is the Difference Between Unsatisfied and Dissatisfied?